Accounting for up to 56% of market share in the US and 40% worldwide, the quad-socket market is the last stronghold of AMD. It is a small stronghold, as for every 4S server, there about 17 dual-socket and four single-socket servers sold. However, since each 4S server contains four CPUs, the 4S server market accounts for about 10% of the server CPUs sold. More importantly, the margins are quite a bit higher than in the popular 2S market, and as a result those 10% of server CPU shipments are good for 20% of the revenue, and it gets even better. IDC expects that in 2008 the 4S market will grow up to 14%, more than twice the growth of the dual-socket server market. GCC reports that about 57% of 297 enterprises reported that they are going to buy quad-socket servers, and no less than 31% indicated that they were going to buy more quad-socket systems than in the past. Only 15.5% said they would buy less of these systems. This trend is relatively easy to explain: IDC studies indicate that the number of x86 servers bought for the purpose of virtualization will show a Compound Annual Growing Rate of 40-45% until 2010. Although IDC's studies have been overoptimistic before, we think it's safe to conclude that the 4S x86 market has a bright future ahead. It is no surprise that AMD and Intel have started a bitter fight for this profitable market. The hostilities started to heat up in early Q3 of 2007. AMD introduced a 3GHz (95W) Opteron 8222 and 3.2GHz (120W) Opteron 8224 that outpaced Intel's Xeon MP "Tulsa" by a wide margin. Just a few weeks later, the most impressive Xeon MP launch we have seen in years became a reality: the Caneland platform with the Intel Xeon "Tigerton MP" was born. The new Intel 7300 chipset offered no less than four independent FSB, twice as many as the previous quad-socket platform, but the most important improvement was the CPU: the old Xeon 71xx CPU had two NetBurst based cores; the new Xeon 73xx was a quad-core CPU, based on Intel's 65nm Core architecture. At the end of our review of the quad-core Xeon DP "Clovertown", we called attention to an Intel CPU labeled as "Clovertown MP". That is exactly what the current quad-core Intel is, a Xeon MP version of the Xeon "Clovertown" 53xx DP. Originally, the "Clovertown MP" was probably a backup plan of Intel's Whitefield processor, a quad-core CPU with a massive shared L2 cache. As Whitefield failed to materialize, plan B went into action. The Clovertown MP was renamed to "Tigerton", or a 65nm quad-core Xeon MP that is based on two dual-core "Core" chips. Intel conquered the dual and single socket server markets as you can see in the graphic below. Its "Core" based Xeons have been gaining ground quickly for almost two years now. The sharp increase in market share since the introduction of the dual-core "Core" architecture ("Woodcrest" May 2006) and quad-core (November 2006) is remarkable. A more recent report of mercury research claims that Intel Server CPU unit share is still about 87% which is a crushing superiority in market share. 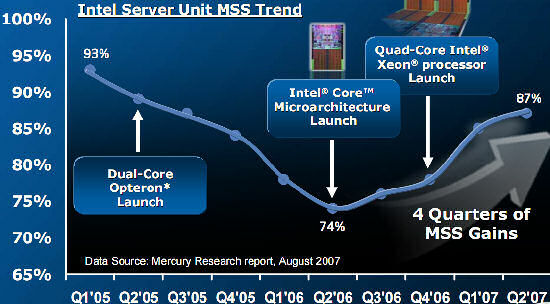 Since the introduction of the Core architecture in Q2 2006, Intel has gained ground quickly. The introduction of quad-core Xeon MP should not have been a big problem for AMD, as it launched the "native" quad-core Opteron 83xx series a few weeks after the appearance of the Intel's Xeon MP. Unfortunately for AMD, the TLB bug threw a fly into the soup. While this bug is irrelevant for the desktop market, erratum 298 is not acceptable in the quad-socket market. On a virtualized server there is a small chance - compared to the infinitesimal small chance in desktop use - that the bug could rear its ugly head. That allowed Intel's Tigerton to besiege the last AMD stronghold for more than 7 months. The only thing AMD could do is lower the prices of their server CPUs. AMD managed to keep the market share loss to a minimum but the average selling price of an AMD server chip fell from a little less than $400 (Q2 2007) to less than $300 at the end of 2007. Something had to be done, or the Intel engineers would get bored without a decent challenge….